A complete change in the weather today, compared to what we have become used to recently. It was a rather quiet sea watch this morning, the highlights being 54 Sandwich Terns, four Bar-tailed Godwit and four Fulmar. 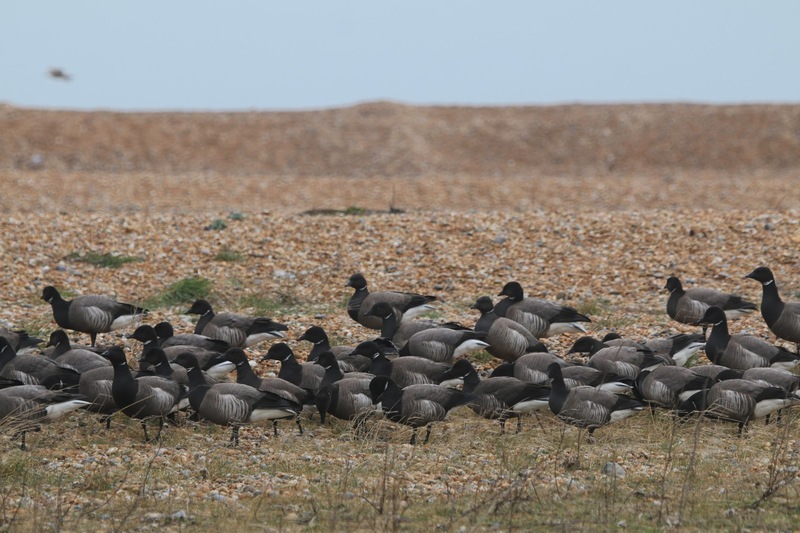 It also produced no Brent Geese, although by the afternoon they had once again started moving, with a total of 510 seen. 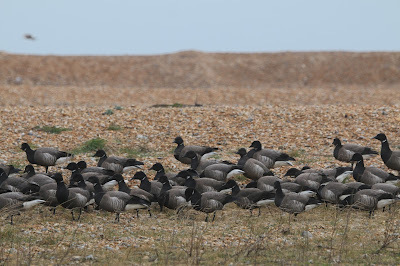 51 of these geese settled briefly on the beach by the fishing boats. Surprisingly, one of the birds was colour-ringed! So hopefully it won't be too long until we get the details. On the land, the bad weather meant that many of the birds were hunkered down in bushes. The Wheatear was still up by the Lifeboat Station this morning. Two Black Redstarts were seen today, one is frequenting the area around the Lifeboat Station and the other was along the Power Station Fence. Only three Firecrest were seen today, with one heard in the trapping area and two being particularly showy by the Lighthouse Garden, often being very confiding and coming within a few feet. Three Porpoise were also seen this morning in front of the Power Station.